Description: This is another of Denny's good friends that he met awhile back. His name is Gene Hartung. 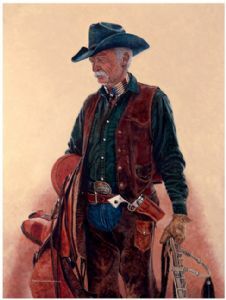 Gene was soon-to-be 72 years old at the time of this painting. Gene lives right across the Buffalo Bill Dam near Denny. He happened into Denny's store/gallery awhile back and Leigh, Denny's wife and photographer, immediately asked him if he would pose for Denny. He told her a story of how Denny's mentor, James Bama, had asked him the same question several years ago and how he had agreed to pose for James to take photos also. What a shame Bama never painted him! His loss was Denny's gain. Original is 18" x 24" on "museum-grade" Masonite.